New Broughton in Salford Manchester, has been transformed by Countryside Properties, in partnership with Salford City Council and other stakeholders to create an inclusive, vibrant and attractive community where people have a real desire to live and work. The development, which extends over 74 hectares, involved the creation of New Broughton Village, a sustainable community featuring more than 3,000 mixed-tenure homes and range of community facilities including shops, leisure, employment, schools and training centres. The landscaping products supplied by Marshalls played an important part in delivering this vision, which is now improving the quality of life for residents, as well as attracting new visitors to the area. 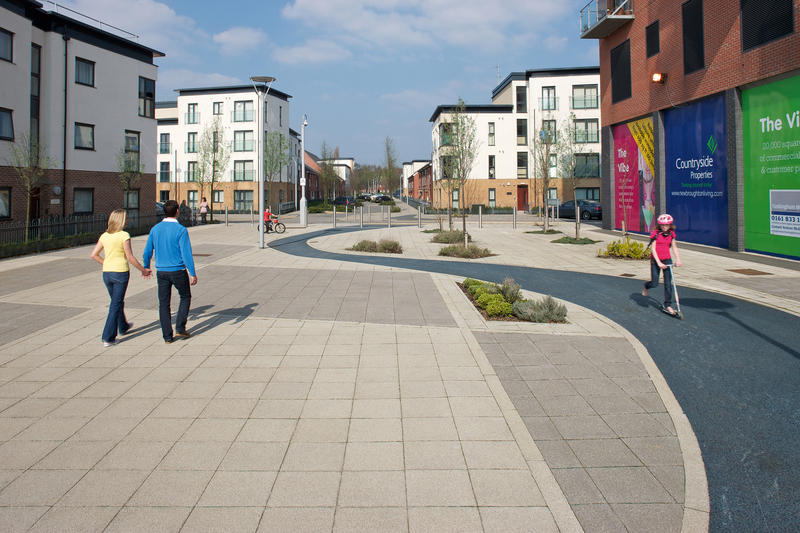 The local community was at the heart of the planning and redevelopment of the area and the specifiers worked extensively with residents to ensure an inclusive approach was taken to achieve an aesthetically pleasing, safe and low maintenance hard landscape. There were two main challenges posed by the landscaping elements of this project. The first was interpreting the feedback from existing residents into a coherent design, looking for outdoor areas to be created which were distinctly separated from vehicular roads. The scheme designers worked with Marshalls to work out how this could be achieved in reality. The designers had to work out how to keep vehicular and pedestrian traffic separate. After considering various alternatives, the designers devised a spatial landscape that would result in the roads being separated from the footpath using a thin strip of land planted with a mix of grass, flowers and trees. As well as adding to the variety of the overall scheme, this design met the needs of parents who were looking for safe walking and play areas. Once this challenge had been overcome, Marshalls’ Mistral Textured Granite Sett Paving in Charcoal was specified for the roadways. The darker coloured Charcoal Mistral was chosen for this element because it clearly denotes vehicular routes throughout the development, whilst creating a more appealing aesthetic than asphalt, tarmac or other bitumen surfacing. The exposed granite aggregate setts create a stunning visual effect on the roads at New Broughton and the use of the Mistral Granite Setts helped realise the designer’s vision of a contemporary public space. 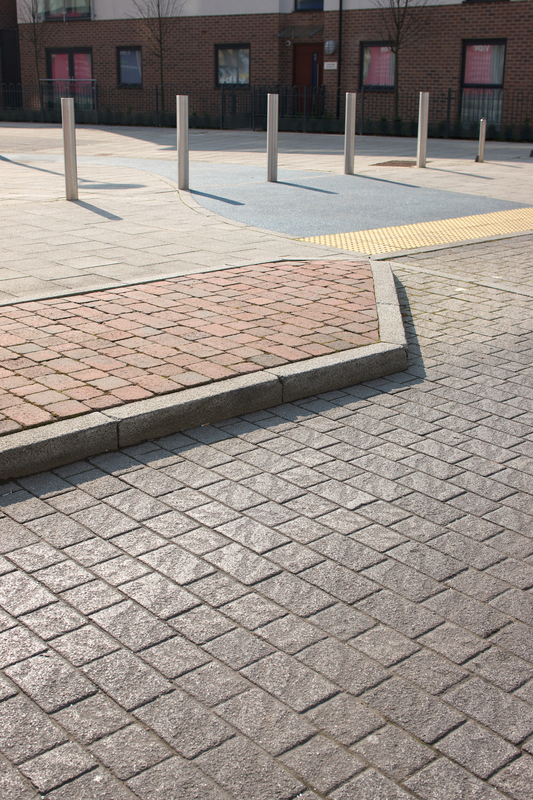 Conservation Kerb in Silver Grey was used to complement the Mistral Textured Granite Setts. The footpaths that were separated from the road by the treelined avenues were created using Marshalls’ Conservation Textured Concrete Paving, along with Conservation Kerbs, both in Silver Grey. Use of the lighter colour Silver Grey clearly denoted the pedestrian routes, whilst retaining a spatial link with the Silver Grey Conservation Kerb used on the roadways. Complementing this design Geo Disc and Geo Parklight Symmetric lighting was chosen from Marshalls’ specialist business, Woodhouse. 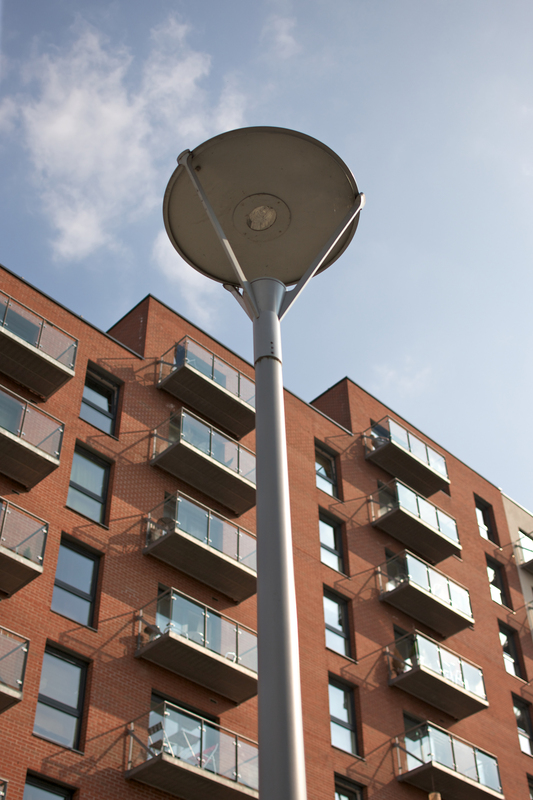 The lighting is manufactured in high quality materials and provides a comfortable, uniform illumination that is ideal for use in pedestrian spaces. Detailed and careful planning of deliveries was required on this development due to site restrictions on access times and duration as well as size of deliveries, whilst working around the volumes of traffic created by the city centre site. Timing was critical on this aspect of the project and was the reason why Marshalls had personnel on site to ensure the schedule was implemented as planned. The landscaping has made a huge contribution to the aesthetics, as part of making New Broughton an area in which people want to live, settle and bring up their families. New Broughton is now attracting new residents, who recognise it as an attractive and thriving community, where people feel safe, happier and have pride in their area. This unique partnership approach to delivering the hard landscaping areas has helped capture the community spirit at New Broughton Village. The development itself has improved the quality of life for existing residents, which has added to their sense of pride and feeling of belonging to the area. It has also helped to attract new residents to the area, who have in turn stimulated the economy, creating investment and new enterprise, for the benefit of the whole community.